Welcome to another installment of If My Book, the Monkeybicycle feature in which authors shed light on their recently released books by comparing them to weird things. This week Erica Wright writes about her second novel, The Granite Moth, just published by Pegasus Books. If The Granite Moth were a high school superlative, it would be Most Likely to Avoid Reunions. Or Most Likely to Need Witness Protection. Or Who? If The Granite Moth were a meal, it would be $1 pizza and a bottle of champagne. Ramen and duck pâté. Taco Bell and that nice place your parents take you when they’re in town. If The Granite Moth were an app, it would locate the closet wig shop. If a date night, Lucky Cheng’s. If a mode of transportation, definitely not the tram to Roosevelt Island. Not a ferry either. Maybe a bicycle dressed like an alligator with a boombox hidden in the snout? No, no, if The Granite Moth were an app, it would make your voice sound like Lauren Bacall. It would make your hair shine like hair shines on TV. It would make your legs longer. Your teeth straighter. They would have the posture of late-night news broadcasters and the sass of camera operators working overtime. If The Granite Moth were a sidekick—nobody wants to be a sidekick. If The Granite Moth were a cruise ship, it would be The Queen Mary. And when passengers lined up for the buffet, it would sing “Rocket Man.” If The Granite Moth were a plant, it would be a corpse flower. It would be embarrassed by the gawkers, but understand them all the same. 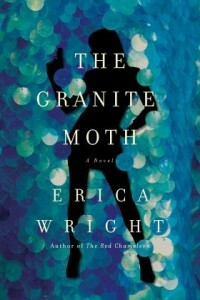 Erica Wright’s latest crime novel is The Granite Moth (Pegasus). Her debut, The Red Chameleon (Pegasus), was one of O, The Oprah Magazine‘s Best Books of Summer 2014 and was called “riveting” by Publishers Weekly. She is also the author of the poetry collection, Instructions for Killing the Jackal (Black Lawrence Press, 2011) and the chapbook Silt (Dancing Girl Press, 2009). Find out more at ericawright.typepad.com, or follow her on Twitter at @eawright.